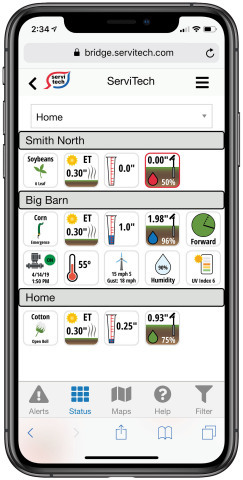 ServiTech, Inc., the nation's largest crop consulting and agricultural laboratory cooperative, today introduced the ServiTech Bridge™ Field Intelligence platform to growers and ag retailers for the 2019 planting season. A subscription-based service available for mobile devices as well as desktop applications, Bridge uses in-field sensors and analytics to give growers vital information about field and crop conditions right in the palm of their hands. ServiTech Bridge is the first-of-its-kind software platform to help manage all aspects of a grower's farm. It is a subscription service using in-field sensors and analytics with no equipment to own or install. ServiTech Bridge allows growers to customize the platform based on their individual needs, making it highly-scalable and intuitive to improve decisions about irrigation, crops and equipment to maximize farm operations, for one field or hundreds of fields. "ServiTech is pleased to introduce its Bridge platform, available now to growers who need to more closely monitor their crops and inputs," said Greg Ruehle, president and CEO of ServiTech. "This is a revolutionary technology platform that will change the agricultural landscape, allowing growers to customize the view of their crops instantly, 24 hours a day. We are excited to see how the ServiTech Bridge impacts the live of our customers." ServiTech Bridge is easy to use, has intuitive settings and includes alerts and quick views to provide the vital information needed to maximize each field's yield, making a complex farming organization more efficient. The information is formatted to be easily interpreted, allowing the grower to prioritize their day with customized alerts to have the greatest impact on time and money. Bridge is the most comprehensive grower's aid, and allows an organization to make decisions based on real measurements, not just models. ServiTech, Inc. is the nation's largest crop consulting firm and agricultural laboratory. Started in 1975, ServiTech relies on the most current technologies, research and science to make productive and profitable recommendations for thousands of growers on millions of acres in North America. In order to help growers reconcile incoming data, keep up with new technology and enhance their return on investment, the company launched ServiTech Expanded Premium Services, LLC (STEPS), focusing on the exploration, development and field testing of cutting-edge technology in the agricultural sector. In 2015, ServiTech celebrated its 40th anniversary. For more information on the Bridge platform, please visit: www.servitech.com.